A Christmas Carolrehearsals have officially commenced, meaning the festive season will soon be upon us! Here Assistant Director Charissa Martinkauppi talks us through the exciting happenings during the company's inaugural two weeks in-residence. The months leading up to December tend to find me muttering Scrooge-like curses over the early appearance of Christmas decorations, Christmas foods, and Bing Crosby on the radio. But as our protagonist Ebenezer Scrooge, played by Felix Hayes, I have been redeemed and found myself seduced by the Christmas spirit even before the end of October. It took no more than a first read-through of artistic director Tom Morris’ adaptation of A Christmas Carol and I was already won over. Any adaptation of a classic will always breed a slight unease with the potential audience, as we wonder if it’s really going to be the story we know and love. I can assure you, it will be that and more! This production stays true to the beloved classic, but adds many new surprises and elements that only enrich Dickens’ tale about the man who turns away from greed to embrace generosity and charity. 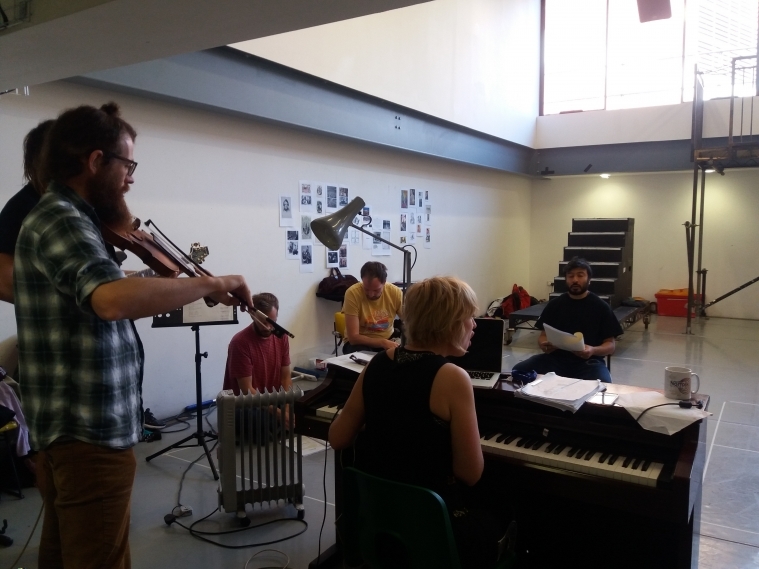 Our first rehearsal took place on 22 October and the following days were dedicated to building the foundations of a rich and multi-faceted piece of theatre. The first days of any rehearsal process are about laying the foundations of the piece, but this particular production has many foundations to lay. Most of the actors are playing several characters each, and this multi-talented cast will, apart from inhabiting the well-known characters, also sing, dance, play music and operate puppets. Director Lee Lyford’s process of building these foundations has consisted of playing games, exploring the characters, and creating a common theatrical vocabulary. This has resulted in a very playful and generous rehearsal room. Lee’s work has also been interwoven with voice work, music and singing under the direction of Gwyneth Herbert, the production’s composer, musical director and Ghost of Christmas Present. Apart from the different creative languages, this production also contains more than one linguistic expression, as parts of the play will be performed in British Sign Language. Cast member Nadia Nadarajah, who is a Deaf actor, plays Bob Cratchit as well as several other characters and has shone a light on how, through simple means, both performance and rehearsal can be made open to all and represent D/deaf culture truthfully. On the first day of rehearsal Nadia held an informative D/deafness awareness workshop in which she gave us a brief history and contextualisation of D/deaf history and culture, exposed our preconceptions, answered our questions and introduced us to the basics of BSL. These first two weeks of rehearsals have set the foundations of A Christmas Carol through hard work and a lively exploration of artistic expressions and text. From here onwards I expect that both the work and the expressions will become livelier and more intense in this creation of a ghostly Christmas show. A Christmas Carol draws a festive end to our radical Year of Change. To purchase tickets or to find out more, visit the show page here.